I have to say a huge thank you to Crystal Collier for giving me this award. I think she is so super cool and talented. Thank you. 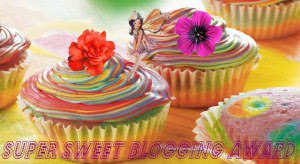 Nominate a baker dozen (13) bloggers. What is your favorite dessert? There are so many I cannot just choose one. But what I don't like for dessert is any type of fruit. Cake or ice cream? Cake of course! When do you like desserts most? Anytime of the day. I have a really sweet tooth. Would you choose cookies or cake? Cake! I love cake. I know I am being a bad sport, but I really hate having to choose who gets what award. Plus, I had a list of people to give this award to, but there were more than 13 people, so I just couldn't make up my mind. So please, if you follow my blog, feel free to grab this award. You deserve it, because you guys always give me so much support. Congratulations on getting the Super Sweet Award! It's perfect for you! Congratulations, and I'm not going to pass up on that award, even if I don't deserve it, I just love all that cake, Murees!! Deanie - Thank you. Please do feel free to grab the award. Tonja - Thank you. And honestly, please grab this award for yourself. Carole - You are just amazing, of course you deserve this award. Whenever I see this award, I always want to go hunt down and demolish a cupcake. Hi Murees .. congratulations on the Super Sweet award - and more importantly well done on putting out more approaches to publishers .. and having a positive take on their replies ..
Katie - Thanks! I love cupcakes too. Don't be shy on picking up this award for yourself. Hilary - Thank you! I am trying to be positive and hope that something goods comes from it. Please, feel free to grab this award. Rebecca - Thank you! Cake is just the best. I can never have too much cake. Please, grab this award for yourself. Cake should be its own food group. Lynda - Thank you. Cake is definitely king in my house. Please grab this award for yourself. Congratulations on the award. Yep, cake and chocolate for me too. Chocolate cake is even better! I tagged you for Katherine Anthony's The Next Big Blog Hop so please stop by www.dhdunne.blogspot.com to find out more. Annalisa - Thank you. Chocolate cake is the best. Please, grab this award for yourself. Deanie - Thank you. I am heading over right now. Congrats on your award Murees. I also love sweets. Cathrina - Thank you. I can't imagine life without sweet things. Please, don't be shy to grab this award for yourself.